Ben Warner began studying with Dr. Yang, Jwing-Ming in 1998. In 2000, he began assisting the YMAA children's kung fu program. In 2001, he became a full time instructor and in 2005 he became head of the YMAA Boston kids program. He has also organized martial arts programs for several schools in the Boston area. In 2002, Ben became a regular instructor for the adults Shaolin program. As well as being a main Shaolin instructor he became the head of the sparring program at YMAA Boston in 2007. Ben has assisted in Dr. Yang's Boston and international seminars since 2002. He has taught Shaolin long fist and white crane seminars. 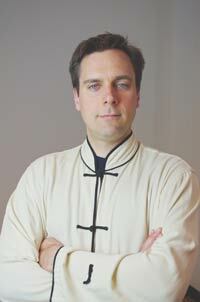 He has also assisted with qigong, chin-na, sword, saber, and staff seminars. Ben has been a featured performer in several YMAA DVDs including Advanced Practical Chin Na, White Crane Kung Fu Basics & Intermediate, Staff Fundamentals, Taiji Ball, and Shaolin Long Fist Kung Fu Intermediate Sequences. He was also featured in the most recent edition of the book "Analysis of Shaolin Chin Na". In 2005, Ben was certified as an instructor with Pavel Tsatsouline's RKC kettlebell program. Since that time he has worked with several internationally renowned fitness instructors including Pavel Tsatsouline, Steve Cotter, Steve Maxwell and Mandla Nkosi. In 2012 Ben became the owner and operator of YMAA Boston. He now organizes and teaches classes for kids, teens and adults. The Kung Fu for Kids is his first program. Kung Fu for Teens is his second DVD program. Mr. Warner lives in Jamaica Plain, MA, USA.